Best known for its famous mummies, the Michael C. Carlos Museum has a phenomenal collection of art from other world cultures, including an impressive 2,300-piece collection of Ancient American Art. Animals are prominently featured in this collection, in contrast to the large number of human figures in the museum's Greek and Roman collection, for example. Of the animals represented, the jaguar, the largest wild cat in the Americas, is featured in its own display, "Jaguars on Vessels." 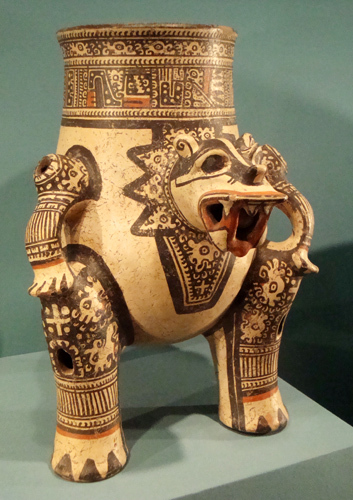 This particular tripod vessel (photo) is from Central America and is hundreds of years old. And it is only one of many intricate, complex, and elegantly beautiful artifacts from civilizations and societies come and gone.